Police reflective vests are made from bright yellow color is produced from 100% polyester mesh fabric. Police reflective vests with the CE mark. Its purpose of using, during the tasks because of the reflector. They are providing a high level of duties satisfies in a relaxed way. 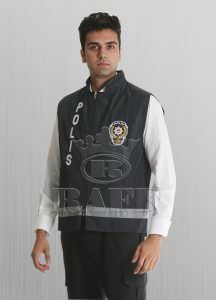 Reflective police vest TS EN 471 + A1 standard is produced in accordance with the appropriate technical specifications. Reflective police reflector vests in size, will be manufacture at least 5 cm. Police reflective vests manufactured in accordance with the technical specifications as windproof. It laminated breathable membrane. The reflector vest is made of two-layered fabric lining and insulation fiber. The fabric used on the outside air permeability value of 5 1 / m2 is less than the water vapor resistance of 6 m2p / w should be low. The outer fabric warp and the lower direction feature has the tensile strength of 300, also has durability against wear 30000 round. Insulation value of the insulation lining is production of canning over 2.8 on clone. In front of the vest is made easier to use 2 Velcro strips sewn.